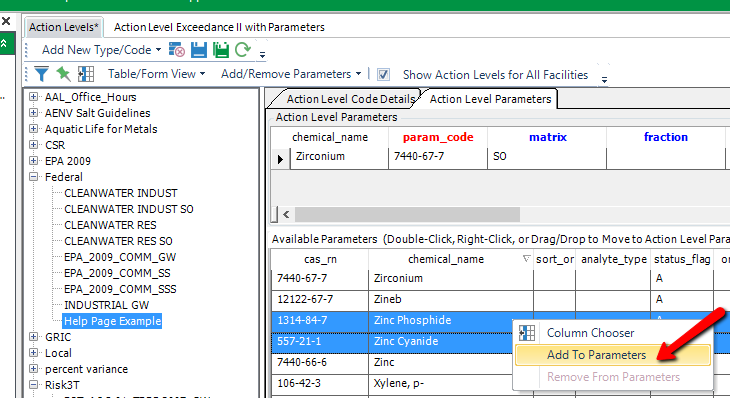 To add parameters to the action level, select one or multiple analytes from the Available Parameters pane. Right-click anywhere in this pane and select Add to Parameters. All the highlighted parameters will be added to the Parameters pane. •Drag and drop from the Available Parameters pane to the Parameters pane. •Select Add To Parameters from the Add/Remove Parameters drop-down on the toolbar. Once Parameters have been added, select Save or click the Save button on the toolbar. If an Action Level Code already exists with the same or similar list of Parameters, it may be quicker to Copy Action Levels. Once parameters have been added to the action level, the parameter values can be added. 1.Select the parameter to edit. 2.Press the Tab key on your keyboard to move from cell to cell or click the mouse on the cell to edit. 3.Enter the action level values and a unit. The only field required in the Parameters pane is the PARAM_CODE; however, to make the action level useful, the ACTION_LEVEL and UNIT fields must be populated (remaining fields may be useful for certain reporting criteria). Click Save on the toolbar once action level values have been edited. •Click Delete on your keyboard. •Right-click and select Remove from Parameters. •Select Remove From Parameters from the Add/Remove Parameters drop-down. The Available Parameters pane is populated from the RT_ANALYTE table. Add new parameters to the available parameters by editing the RT_ANALYTE table. •The CHEMICAL_NAME column from RT_ANALYTE is displayed in the Action Level Parameters and Available Parameters Lists so that the filter can be used to search by CHEMICAL_NAME. •The RT_ANALYTE.STATUS_FLAG must be set to "A" in order for the chemical to be displayed in the Available Parameters list. Click on the header of a column (i.e. CAS_RN, CHEMICAL_NAME) to sort data in the Available Parameters pane by that column. A triangle will appear that indicates an ascending (pointing up) or descending (pointing down) sort.